The deadly collapse of the Teton Dam east of Rexburg, Idaho, in June 1976 was one of the U.S. Bureau of Reclamation’s worst moments. Conservationists had been fighting the dam as a waste of money and destruction of a beautiful fishing stream. The canyon was also filled with wildlife, especially in the winter. No one thought it would collapse, but the dam fell apart as soon as they filled it. Eleven people drowned and there was a billion dollars damage. Incredible as it my seem, some local irrigators started agitating to rebuild. It was an unpleasant joke, but most forgot about it until recently when some “penny pinching” members of the Idaho legislature starting saying it should be rebuilt, hopefully by Uncle Sucker. American Rivers commissioned a poll in the area. They found a slight majority in favored of rebuilding the dam, but when presented with an alternative, greater efficiency of water use, the number were strongly against it. Given the economic climate it is hard to see how Congress would appropriate a billion dollars to rebuild this structure. Rocky Barker has a full story on his blog in the Idaho Statesman. The practice of fracking, or hydraulic fracture drilling has been a highly damaging practice wherever it is used and now Congress is asking the EPA to take a harder look. Diesel Use in Gas Drilling Cited as Violation of Safe-Water Law. An interesting study has been released by the Center for Snow and Avalanche Studies which explains that spring runoff from the Colorado Rockies has been compressed into a shorter period of time due to high levels of dust found on the mountain’s snowbanks. Evaporation and sublimation of the warmer snow itself–then transpiration from the earlier-exposed vegetation–results in water losses to the atmosphere, losses that then don’t go into runoff. 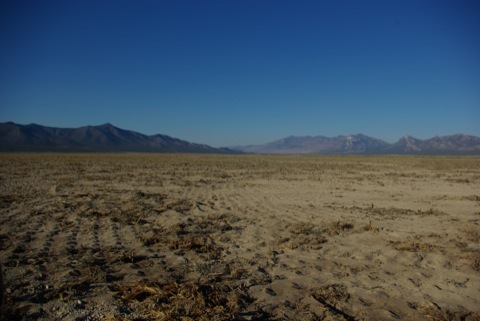 According to the study, the dust loading is five times greater than normal due to human activities such as livestock grazing, activities associated to livestock grazing such as vegetation treatments like these pictured in Nevada, and other disturbances.